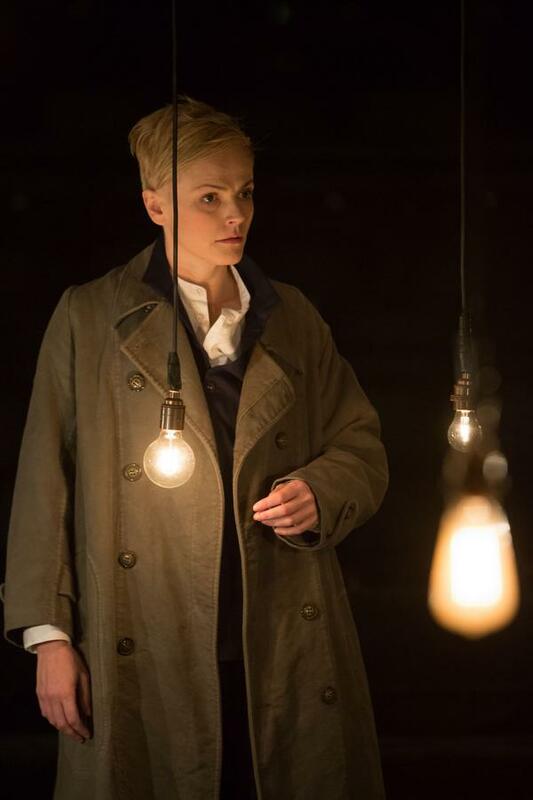 Maxine Peake’s Hamlet is a cross between a warrior angel (one of the beautiful lovelorn angels Philip Pullman writes) and the Little Prince. Unselfconsciously wise, relentless in gouging the truth out of everything, occasionally scary, earthy and alien, warm and mischievous and never more himself than when he laughs. While his insanity is not entirely an act, he is unperturbed by it. He knows something beyond the obvious. He is trapped at the beginning of the play, he finds a mission and a way out when he meets the Ghost, and goes home at the end of it. Peake is scorchingly good, above all in her ability to connect and hold the world at the palm of her hand: this Hamlet could raise an army if he wanted, and we are it. Taking a cue from the lead, the production embraces the open-hearted humanity of the play. Half a dozen scenes become instant classics: the meeting of Hamlet and the Ghost is a scene of immense beauty, as if all the love between father and son has been turned inside out. The players (that include young actors from the Royal Exchange Young Company) introduce a world of innocent contradictions, to the point that the play within the play becomes a pivotal moment and a door to a new world. The graveside scene is brilliantly staged, allowing for an imaginative reading of the mortality theme. Special mention for designer Amanda Stoodley who creates a raggedy tactile world that never feels cheap. The rest of the cast adds their particular kind of magic: John Schrapnel is a Ghost of controlled but infinite despair, as commanding as he is moving. By contrast his Claudius is coldly calculating, even in remorse. Barbara Marten subtly suggests Gertrude’s struggle, even at her husband’s side. Gillian Bevan’s Polonia embraces the machiavellian machinations of the court with such energy and richness you almost forgive the “mommie dearest” relationship with Ophelia. Thomas Arnold’s Horatio is brilliantly understated but always present and fierce in his warm relationship with Hamlet. Katie West’s Ophelia finds a streak of rebellion before life and courage and sanity are squashed out of her. Jodie McNee’s Rosencrantz manages the contradiction of a punky exterior and a corporate heart. Ben Stott makes his mark with a touching Player Queen and a subtly supercilious Osric. Claire Benedict’s Player King effortlessly carries the truth of human experience that the players represent. And last but not least, the young actors of the company more than rise to the occasion and show everyone how it is done. The production does away with all political references. No matter. With such an immediate all-encompassing version of the play, anything left out feels inconsequential. It’s not a definitive production of the play – because such thing doesn’t exist. But it is as rich and as vital as any Hamlet production I have seen. As with most of my Shakespeare reviews, below is the SPOILER section (specific observations about the production that you shouldn’t read before you see it). – To Be or Not To Be makes a very late appearance, immediately after the closet scene and Polonia’s death. Somehow, that takes the suicidal sting out of it – we just had a murder and mortality is about the death of others. That approach is a good fit for this Hamlet who is never morose or depressed. – Laertes reunites with Ophelia in her madness and is part of her rosemary scene (where some of Claudius’ lines are given to Laertes). 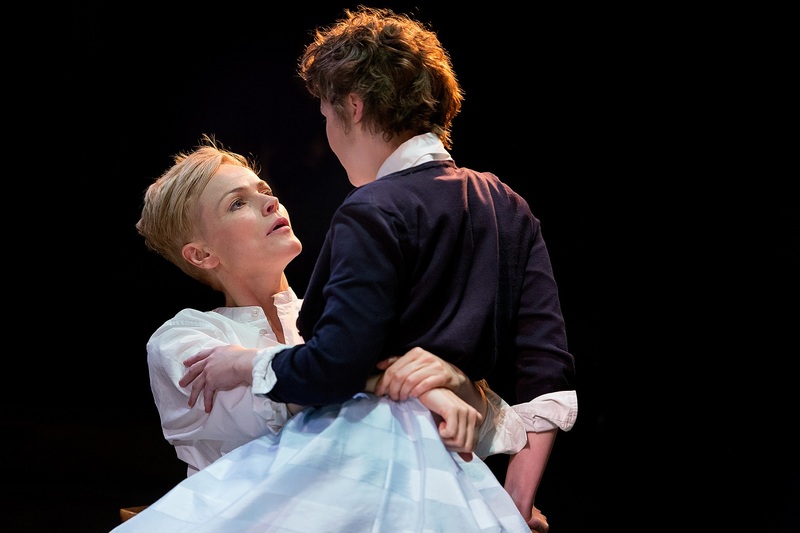 – When I started playing around with the idea that Maxine Peake’s Hamlet is – at least in part – the Little Prince, it all felt like a leap of faith. Then I read the passage when the Little Prince dies: “He remained motionless for an instant. He did not cry out. He fell as gently as a tree falls”. There is no better description for this Hamlet’s death. – Hamlet is reading Machiavelli’s The Prince. – David Bowie has a marvellous year in the theatre: after Starman being the moment of reckoning in My Night With Reg, his Lady Grinning Soul is the song the players sing as they make their entrance for the play within the play. It’s an eery, intoxicating rendition, that combined with the child actors doing the dumb show immediately afterwards turns the scene into a profound and unexpectedly moving moment, a portal to another world. – The graveside is created by armful of clothes being dropped from above and then rearranged to create the hole of the grave. Among the items, sweaters are folded to the size and the vague appearance of skulls. One of them is Yorick, who is hugged and handled in a way that wouldn’t be possible with a real skull. The chill of death is absent but again, consistency of vision is preserved, this is not a Hamlet who was scared of death in the first place. – Rosencrantz offers Hamlet cocaine. Hamlet doesn’t take it. – When Gertrude – unbeknownst to her – drinks the poison and approaches Hamlet with the line “Let me wipe thy face”, mother and son have a final tender moment. In the 2008 Royal Shakespeare Company production, Penny Downie’s Gertrude knowingly drinks the poison and then tries to wipe her son’s face. David Tennant’s Hamlet, flushed by the heat of the fight, pulls away, never giving them a final moment together. Curtain call watch: Maxine Peake taking her solo curtain call was a joyous moment, not only because the audience was appropriately enthusiastic and she looked happy (as she should be) but also because she had a brief moment of confusion and mirth when she forgot which sides she had taken a bow to. UPDATE 15/9: Does Hamlet reflect back the audience as well as the actor who plays him? My friend revstan and I saw the same performance and although we are as one in our enjoyment of the production, we have different takes on the character of Hamlet. Her review is here. This entry was posted in Curtain Call Watch, Reviews, Shakespeare and tagged Amanda Stoodley, Barbara Marten, Ben Stott, Claire Benedict, Gillian Bevan, Jodie McNee, John Schrapnel, Katie West, Maxine Peake, Sarah Frankcom, Thomas Arnold. Bookmark the permalink. Fabulous review! Wish I could have been there, but I’ll live vicariously through your account of it. Sounds bloody fantastic. Massively, massively jealous of anyone getting to see this. Great review and I have my fingers crossed it will get the NTLive/Digital Theatre treatment. As ever, excellent reviews from both you and revstan. Good to read them knowing I’ve seen the same performance – so can more easily compare your various takes on the production with my own. Saw it last night…every bit as good as the review. Maxine Peake is a force of nature. John Shrapnel was great and the ghost scene and the dumb show were stand out moments!